Is selling your home on your to-do list for 2019? While selling a home can be a big undertaking, it’s much easier if you strategize and set goals. If you’re planning to put your home on the market in the next few months, why not use the New Year to help you get started? Here are seven New Year’s resolutions to make if you’re selling your home next year. 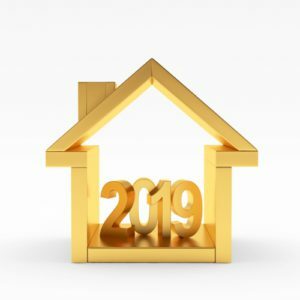 If you want to list your home in 2019, then make the resolution to finish minor repairs. It’s easy to let small jobs fall off your to-do list. But it’s essential to tackle them before potential buyers view your home. Patch holes in drywall, fix leaky faucets, and replace burned-out light bulbs. When you’re selling, you want potential buyers to be able to imagine themselves in your home. Help them by cleaning, de-cluttering, and de-personalizing. Go through your belongings and purge what you no longer need or use. Box up personal items and keep them in storage until you move. Thoroughly clean the house, including floors and windows. If you’re ready to sell, then it’s time to make a plan. Set a listing date well in advance so that you can make a timeline and coordinate your efforts. There are many steps involved with selling a home. When you set listing date, it’s much easier to manage your time and be methodical with your approach. While you may have dreams of completely renovating the kitchen before you sell, it may not be in your best interest. There are some repairs and renovations that will bring a return on your investment – and some that won’t. Take the time to research which renovations will actually improve your bottom line. Understanding your local market is key when you’re selling your home. Look at recently sold homes that are similar to yours to see what the selling price was. Setting the right price is key to a speedy sale that will make both you and the buyer happy. Resolve to be realistic about the selling process. Every seller wants to sell quickly for a high price. But it’s important to know what you can honestly expect in your market. Set a realistic timeline for your sale as well as a realistic listing price. Having unrealistic expectations can cause unneeded stress and worry. Finally, when you’re preparing to sell your home, resolve to partner with a trusted real estate professional. A real estate agent that is an expert in your local market can help ease the burden of the process and offer suggestions and guidance along the way. An agent will understand the details of your market and can help you set the best listing price for your home. They’ll know how to market it to the right buyers, and can be a trusted partner all the way through the closing process. Interview several agents so that you can choose the one that best fits with your goals and personality.